Exploring the idea that we must think of technology in much broader terms than just material culture. Everyone has heard the terms “Stone Age,” “Bronze Age”, and “Iron Age”; associated with particular periods of history. For most people, these terms conjure up an entire image of the social and political environment that existed during that period. Indeed, when discussing technological developments through time, we have gotten into the habit of distinguishing eras by advances in artifacts alone. At first glance, this seems legitimate–after all, a society based on stone MUST be drastically different from one based on iron, right? Although there is certainly some truth to this idea, the real story of technological progress is much more complex than just considering the tools, machines, and materials available to a given society. Economic developments, new ideals, political systems, and other social changes can have as much impact on technology as some new gizmo or gadget…perhaps even more! This essay explores the idea that we must think of technology in much broader terms than just material culture. It does so by comparing and contrasting the Middle Ages (roughly 500AD to 1500AD) with the British Industrial Revolution (roughly 1750AD to 1850AD). 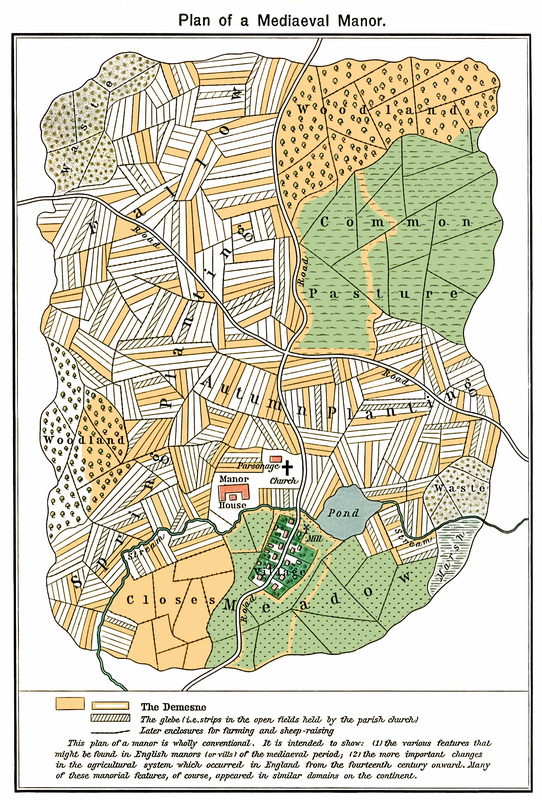 The population of the Middle Ages was mostly rural, with open fields cultivated in discontinuous strips by “peasants with rights of pasture, fuel and game on the overstocked common” (Deane, p 37). The population of the British Industrial Revolution, on the other hand, was mostly urban. This is not surprising, since any industrial revolution is characterized by a migration from rural areas into cities, where people can participate in factory work. Although the population moved away from farming centers, they obviously still had to eat, so the productivity of farms must have increased during this period. This was accomplished through an agricultural revolution that occurred as part and parcel of the industrial revolution (Kline, lecture). It is not possible to clearly point out some automated crop-harvesting machine or other facilitating artifact that explains the difference between the state of agriculture in the Middle Ages and the British Industrial Revolution. However, studies have found a slow but systematic social reorganization of land holdings from peasant-owned strips to consolidated units called “enclosures”. This allowed farming to take place on a larger scale, and peasants who had formerly been working the land were available as a source of labor for the new factories (Deane, p 37). There was also another area of change that had nothing to do with a particular invention–just new knowledge regarding crop rotations. Older forms of crop rotation involved fallow periods that occurred as often as once every three years (Deane, p 38). In the new system, farmers found that they could alternate the growth of depleting crops with seed grasses, which served to recuperative the soil as well as providing fodder for livestock. They did not invent a new kind of crop or livestock, they just used more skill in applying what they already had! Although inventions such as the seed drill of 1700 and the Rotherham triangular plow of 1730 certainly helped turn the soil more effectively (Deane, p 37), these items of material culture did not play a very significant role by comparison. During the Middle Ages, most goods were painstakingly produced by hand, without the aid of many automated “labor-saving” devices. 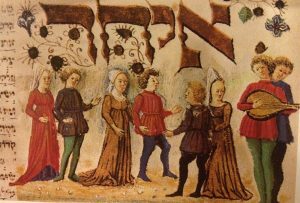 An instructive example of how complex processes were handled in the Middle Ages is given by the piecework system of textile production, where making finished cloth required the participation of several people. There was the wool seller, who kept and sheared sheep. Then there were spinners who made thread from the wool, weavers who crossed the threads, fullers who would raise the nap of the cloth, and dyers who would color it (Kline, lecture). Many of these workers lived in country areas, and although some were also farmers, many worked full-time at their small part of the textile trade (Musson, p 79). All these parties had to work through a cloth merchant who sat at the center of the process. This organization of labor is called merchant capitalism, which is considered typical of the Middle Ages (Kline, lecture). During the British Industrial Revolution, many goods were produced in mechanized factories rather than by hand. Obviously, a large amount of innovation in machine technology had to occur for this to happen, and the British Industrial Revolution is marked by several significant inventions. One of these was Hargreaves’ “spinning jenny” of 1760, which was a wooden hand-operating machine that could be scaled up to factories producing over a hundred spindles of yarn at once. Weaving was also automated using so-called power-looms, first introduced by Edmund Cartwright in 1785 (Musson, p 80). Although these examples might tempt us to say that mere advances in machine technology facilitated the movement of handcraft production to mechanization, such a perspective completely overlooks the ideals of the society that had to change for these factories to be put into place! For example, the Middle Ages had a focus on reducing cost rather than on increasing productivity (Kline, lecture). However strange this might seem to industrial thinkers of today, this is a perfectly legitimate mindset that would have certainly kept big factories from being built, even if they could have been constructed at the time! A social mandate was needed before industrialization could possibly occur–this incentive to mechanize for the British Industrial Revolution seems to have been the growth of demand resulting from a rising population, and a “growing taste for light and colorful cotton goods” (Musson, p 80). Yet even with this demand in place, acceptance of the factories required a great deal of social change, due to active resistance against the automated devices that the Industrial Revolution introduced. Weavers and spinners engaged in such activities as the machine smashing riots of 1826, as well as burning down the houses of Hargreaves and other noted industrialists. They felt that mechanization deskilled craftsmen and took away jobs. Statistics on the unemployment of hand-loomers seem to support this argument, and the factory system had all but demolished the handcraft trades of spinning and weaving by the mid-nineteenth century (Musson, p 82). We should take notice of the fact that the willingness to allow such a reorganization of the workforce certainly owed a lot to the mindset of the majority of society. 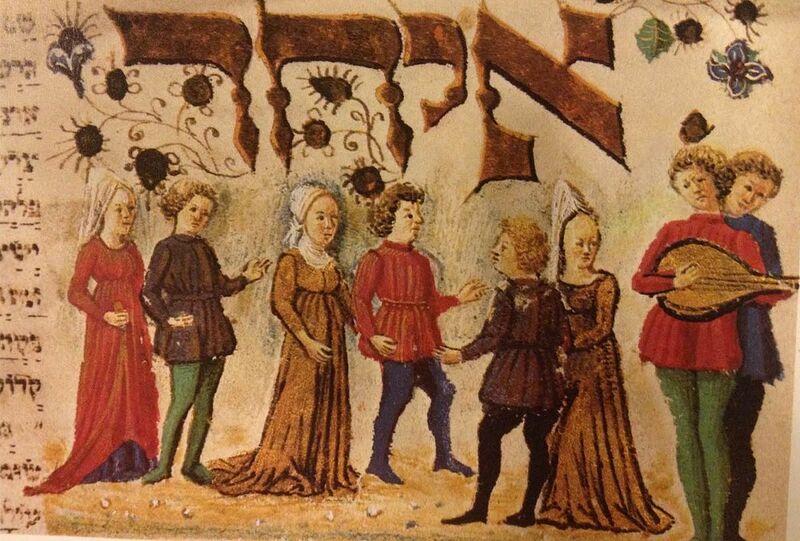 Wood in the Middle ages was the universal material, and was essential in almost every aspect of life. It was used as the fuel for the hearths of private homes and for ovens. It was also used to build houses, water mills, windmills, bridges, fortresses, ships, and all forms of medieval machinery (Gimpel, p 75). However, as the wood in the natural forests started to run out, a need arose to use other materials. This change was also prodded on by political institutions, as laws were handed down to halt or at least slow down the destruction of the forests (Gimpel, p 79). 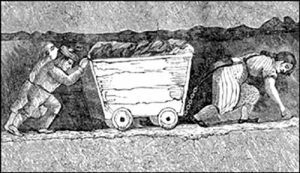 Coal was an abundant natural resource in Britain, and due to the rising costs of timber from the scarcity of trees, it came to be used in domestic hearths during the British Industrial Revolution (Musson, p 97). In the meantime, the iron industry also provided a large demand for coal. Abraham Darby’s substitution of coal-produced coke for timber-produced charcoal made coal an essential ingredient in the production of wrought iron, instead of just a power source for the process (Kline, lecture). The iron industry boomed, and by 1805 iron had replaced timber in the construction of factory machinery, waterwheels, and steam engines (Pacey, p 166). As iron stepped in to take the place as the new building material of the Industrial Revolution, its uses extended beyond industry into agricultural equipment–such as plows and threshing machines. The relationship between coal, iron, and steam power is very complex. Coal was needed to power steam engines as well as provide the coke for the iron industry. Iron was needed to build factories and steam engines. It would be difficult for us to say that the ability for this movement to exist hinged directly upon the invention of a particular type of furnace or other artifact. In fact, even though iron had already been invented, the success of the industry owed a great deal to the knowledge of a new production process using coke, which helped to completely free the iron manufacturers from the “tyranny of wood (for charcoal) and water (for power)” (Musson, p 99). We must also consider the issue of resource depletion and the resulting political laws before we can fully understand why the switch to coal and iron from timber occurred. The Middle Ages are typically thought of as using animate power (horses, oxen, people, etc), which is often laced in sharp contrast with the inanimate power (steam, water, wind, etc) that was widely used during the British Industrial Revolution. In fact, the advent of steam power in the Industrial Revolution is usually pointed to as the origin of modern industry (Reynolds, p 123). This is probably because the steam-powered factories were one of the more conspicuous developments of the period, since they have been emphasized in later factory-reform rhetoric as being &quot;dark satanic mills,&quot; and have been made into symbols of industrialization (Musson, p 109). Yet the Middle Ages clearly had inanimate water power, and had been using it to drive mills for a very long time. The substitution of water-powered machinery for manual labor and the concentration of water-powered industry were “trends well underway before the British Industrial Revolution” (Reynolds, p 130). Also, before we are too quick to attribute the increased productivity of factories in the British Industrial Revolution to steam engines, we should keep in mind that the revolution was initially based on the more widespread use of traditional forms of power. Many factories of the time period were still powered by water (Musson, p 109). 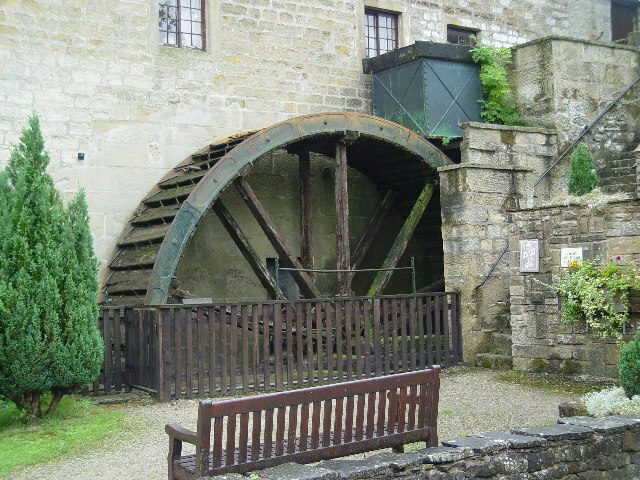 In the face of this evidence, one can be led to agree that the invention of the steam engine as an object of material culture probably had less to do with the differences in technology between the Middle Ages and the British Industrial Revolution than the phenomena of mechanization and urbanization–which were largely based on social factors. In conclusion, there were certainly a profound number of differences between the Middle Ages and the Industrial Revolution. Through numerous examples, this essay has shown that we must think of technology not only in terms of material culture, but also knowledge and skill and the organization of work (including the organization of economy and politics). Indeed, it might be tempting for historians to look at the feudalistic agricultural environment of the Middle Ages and then examine the large steam powered factories that exist in the Industrial Revolution–concluding that the changes were brought about by the invention of a single artifact, such as the steam engine. Yet it is clear that even if a steam engine had magically materialized in the Middle Ages, there would still have been a long way to go in developing the social organizations, knowledge, and skill of an industrial society before the climate we see in the British Industrial Revolution could exist. Hence, we see an intertwining of social change with technological change, and they are bound so tightly that we must consider them together if we are to consider them at all. Originally published by HostileForkBlog under the terms of a Creative Commons Attribution-NonCommercial-ShareAlike 4.0 International license. This entry was posted in History, Industrial Revolution, Medieval, Middle Ages, Technology. Bookmark the permalink.